David returns on upright for ECM, with Joe, Mike and Sheldon on guitar, Frank on piano, and J.D. making a rare appearance on trap set. This soft intro evolves into a jazz feel, with Ohm moving into the solo spot. Singer and Frisina follow, and the tune comes to a natural conclusion before fading out into Road Nights. Beginning with a free section, this spacious funk jam returns Tony to the bass for the last groove of side one. Singer stays on keys, and Garrison returns for some smooth trumpet melodies as this live session flows with solos and song to its concluding cadence and fade. Guitarist Frisina returns with Blaetz on electric fretless bass and Singer on piano for a syncopated stroll. Ohm and Peterson dialog with Frisina, with keyboard splashes harmonizing the groove. This extended live jam features many solos and exchanges, with a free cadenza moving from festival-jam to NYC avant-garde and back, as rhythm returns out of the chaos. Frisina contributes some brass (guitar-synth) as groove and free-style jam interact. At the end, this fades quickly into the 5/4 beat of Hypnotic. Tabla-like sounds from the rhythm and tribal bass from Kenny set up an open funk feel. Peterson keeps the wah grooving while Ohm adds a linear feel and Singer plays wood flute (guitar-synth). The groove spins into a paused chord, and Rickie sets up a complex funk ballad as Singer moves to distorted guitar solo. This groove texture fades out, and into California Daze. A primitive pulse and sparkling notes create a world-beat walking tempo, with Joe, Mike and Sheldon sharing the guitar work. The pulse is the bass, as it is in the last track of the CD. The sound of J.D. AND THE SONS OF RHYTHM is organic. It is what music is before composers, arrangers, lyricists, critics, academics and others shape it to their will. This is the raw substance of music, born in and of the musicians who play it. It is what it is. 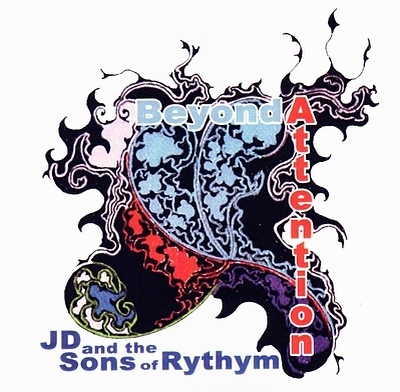 BEYOND ATTENTION, 14 tracks of music on 2 discs.